I called my friend to tell her I was close but it would be a bit before I could meet for drinks [it was her birthday]. I called my boyfriend & best friend, who then came to the BP while I was Twittering my predicament. After much laughing and yelling, they pushed my car while I steered to a parking spot. Apparently I’m terrible at driving in neutral when the car is off. The rain stopped about an hour later; we attempted to jump the car, no go. We had it towed to Gateway for repair [picture below]. 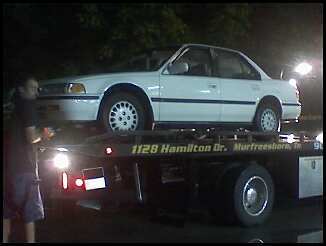 Honda on the tow truck, 7/12. The distributor assembly is burned up. For a minute, I thought it could be because I was low on gas, that’s cheap to fix compared to the distributor assembly. Not to mention, the timing belt assembly is messed up & throwing oil onto my belts, the A/C hasn’t worked in about three years and the windows stick. Rather than fix everything, I’ve been researching cars for over a year & saving for even longer than that. 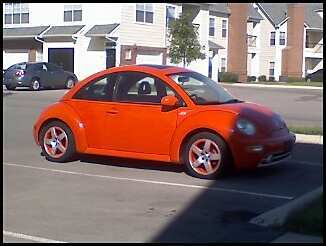 I purchased a 2002 VW Beetle GLS Turbo on 7/14 from Crencor Sales on Rivergate Parkway. They treated me very well, the price was nice and the car is awesome! Very smooth ride and the turbo helps me GO. Now I’m going to go have MARTA emissions done and get my tags.